After very little sleep and quite a bit of alcohol the night before, day 6 started off on the rough side. I was the first one on the bus with hope that I could get a few winks of sleep before getting to the archaeological site. Unfortunately that didn’t happen but this site was well worth staying awake for. 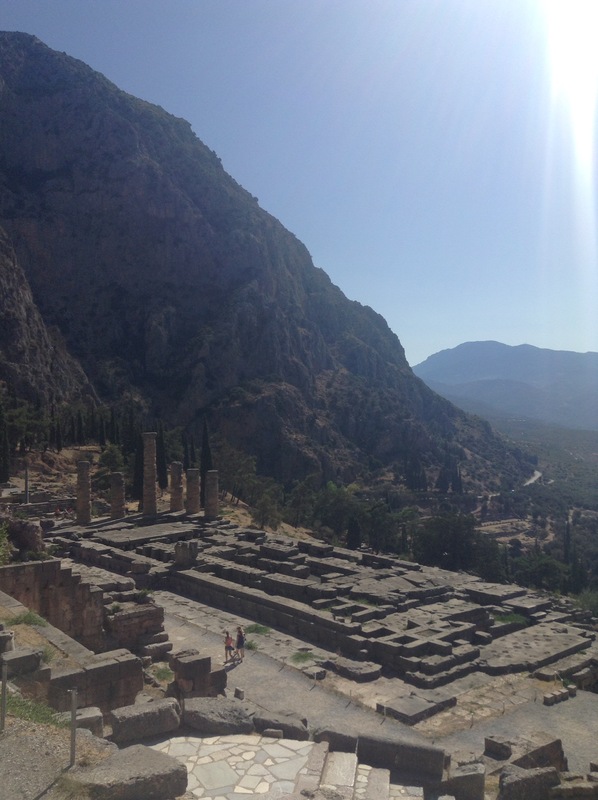 The UNESCO World Heritage Site at Delphi was my favourite up to that point of the trip. Like the other sites we first toured the museum, looking at different artifacts that had been collected on the grounds. After the museum I gulped down a Powerade which helped with the after effects of the night before. It helped greatly with the hike up the site in the heat. There are barely any trees on the site to take cover underneath to escape the sun and it was hot even for being so early in the day. The history at this site was very fascinating. There are stories of an Oracle that people would travel to for wisdom. It was scientifically proven that there were gasses escaping the mountain where the Oracle could be found and could have caused her to enter vision like states. 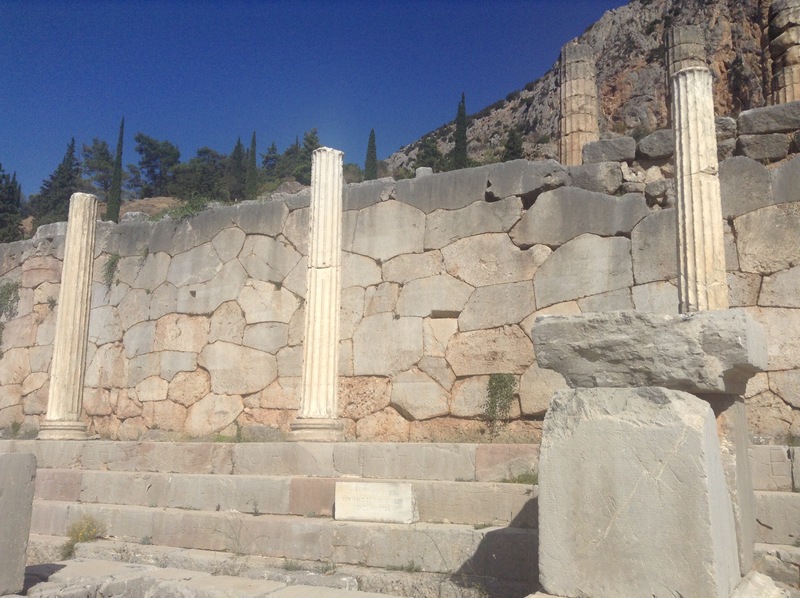 Delphi was thought of as the center of the world, the navel of Gaia (mother nature). History was documented with statues and engravings on the bricks that built the retaining walls and buildings. Many of bricks are still legible, written in Greek. Although most of the items of this site were long gone, they were able to rebuild the treasury. If you trek up all the way up to the top of the site you will find the gymnasium where their own version of the Olympics took place. I was too tired to make the walk but I heard that it was neat. After the site we went back into town for lunch. Most of the group chose to site on a patio that overlooked the valley. We knew that after lunch we would be hitting the road and we wanted to let our eyes feast on that view one last time. We had a short drive until the first stop along the mountain range. We all got out of the bus for a group photo and for some last chance photos of the mountainous area. We then headed back to Athens to wrap up the first leg of the trip. Before dropping us back off at our hotel, the bus took a detour to the most recent Olympic Stadium. It was tough to see everything from across the bus but it, like most of Athens, had plenty of graffiti. We were told that there was an enormous amount of money spent in building these facilities but they are left empty now that the games are over. It has been a concert venue a couple of times but other than that they have no need for such large edifices. At the hotel our group became divided into smaller groups depending on what else we had each signed up for. Some people went home, some would start a cruise the next day and others were to go onto a longer trip on the islands. I was headed for the cruise. I had to say goodbye to the roommate that I considered a partner in crime and an enabler (luckily our paths crossed again). Fortunately I was paired up with one of the girls that I had already befriended along the way. We had one night at the hotel and then had to get up early to get on board the cruise.